Wingspan 45-50mm. A large dark colored flat with a distinctive white patch on the hind wings. The females are larger than the males and have a band of gray scales in the discal area of the upper side of the forewing. 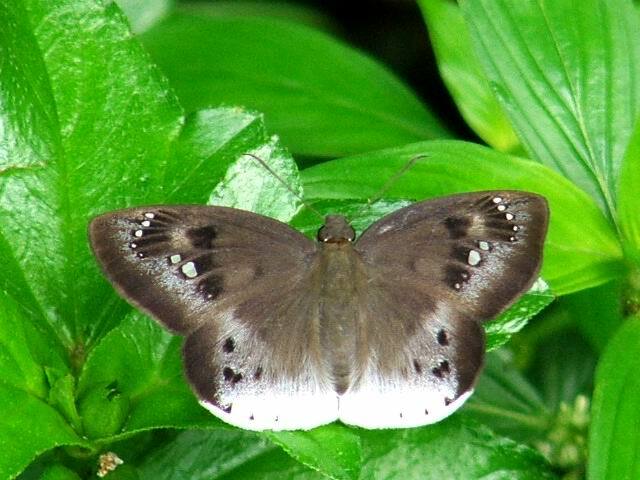 An insect of the forested areas in the intermediate and wet zones ascending the hills to at least 3000 feet elevation. Its favorite habitats are openings in forests, forest corridors and clearings within the forests. A very swift butterfly on the wing with a very straight flight. It frequently settles on the upper side or underside of leaves and immediately opens its wings fully. It never holds its wings above its body while at rest. One usually catches a glimpse of this butterfly only when it suddenly breaks out into the open from its perch when disturbed. It is not uncommon to encounter it day after day in the same patch of forest. It is not an avid nectar lover though it may be seen on flowers. It is seasonal in its appearance, being commonest during the monsoons. I found this butterfly in wet grassy surrounding just after a light rain in a morning. This one was very lazily resting there on these wet grasses. I could take few of his photos with some different settings. What bothers me about this photos is that the butterfly looks too artificial here as his photo merged to a green background. I should specifically say I didn't do any modification rather than changing the file size to fit here. THe contrast of the butterfly to the leaves is great!